Can I Paint the Nursery While Pregnant? For many expectant mothers, preparing the nursery is a rite of passage. Nesting – as some may call it – begins with conception as you try to recraft and recreate your world to make it perfect for the baby. There will be a lot of shopping trips, baby proofing, rearranging of furniture, and sprucing up to prepare for your baby. And, for some, there is the nursery. 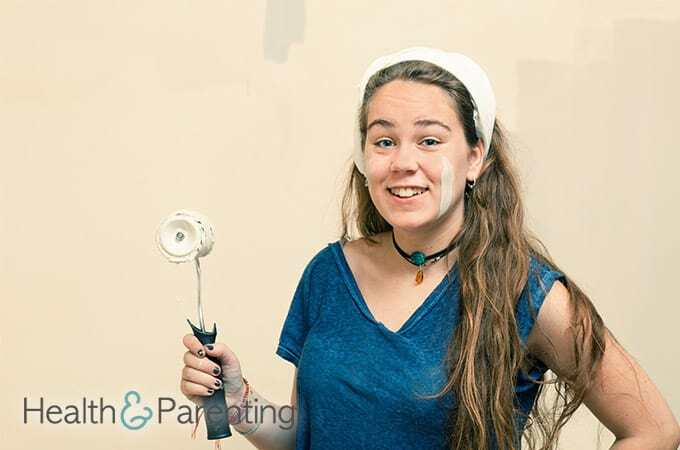 For many women, the question arises of “Can I paint the nursery while pregnant?” After all, you cannot bring a baby home to a nursery that is blah, right? But then again, as a pregnant women you know firsthand and have likely heard from well meaning friends and family that some things are just not safe for pregnant women. Is painting one of those things? According to the CDC, latex or water based paints pose no reproductive risks. Additionally, the short term exposure to paint fumes during pregnancy is generally considered safe. The key here is short term exposure. The greatest risk of any harm to your growing baby seems to be in the first trimester. Beyond that, most experts don’t see a problem with pregnant women painting. That being said, you need to consider other things. It is not just the paint fumes that you should worry about. For one thing, you should be cautious with ladders, because your balance is definitely not what it used to be. Secondly, you want to try and avoid getting yourself in precarious positions, especially late in pregnancy, that could cause injury. And, while the paint fumes may not be dangerous, they may be a quick trigger for a pregnancy headache, migraine or nausea. Most of all, avoid becoming fatigued or overdoing it. Experts also suggest that you don’t handle any decorating products, such as spray paints, that include solvents. If you feel like you want to be a part of the nursery decorating process, then by all means dive in and let your creative juices flow. Just be careful and try not to push yourself too hard. Allow other folks to paint the ceilings, stay off ladders, and of course make sure that the room is well ventilated while you are in there. If you get tired, take a break. You should also avoid eating while painting to decrease the risk that you may ingest some of the chemicals in paint. On the other hand, if you just aren’t up for the challenge of painting the nursery – this is a good time to enlist the help of all the family members and friends who are just dying to help you. Don’t worry, your baby won’t know who painted their bedroom!